Photo from oriental-arms.com, found here. 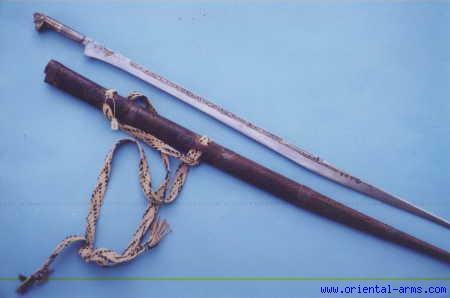 Traditional sword of the Freelanders. Single-edged, with the blade tapering, then flaring out again before tapering to a full point. Deals d8+1 damage, cannot be purchased in towns. The arrow-guide is placed on the interior side of a bow and allows for greater pulls on the bow and heavier arrows, yielding greater damage and armor penetration (though causing a penalty in accuracy). Users take a +2 bonus to their attack rolls, but will roll twice and take the worse result. Increase the bow damage die by one (so a shortbow fires at a d8, a longbow at a d10) while using heavier arrows. The arrow-guide costs 5 dinars; the heavier arrows cost double normal arrow costs. The assegai is a short (2') stabbing spear with a leaf-shaped blade, not suitable for throwing. It deals d8 damage but cannot be used for second-rank attacks. It costs 10 dinars. 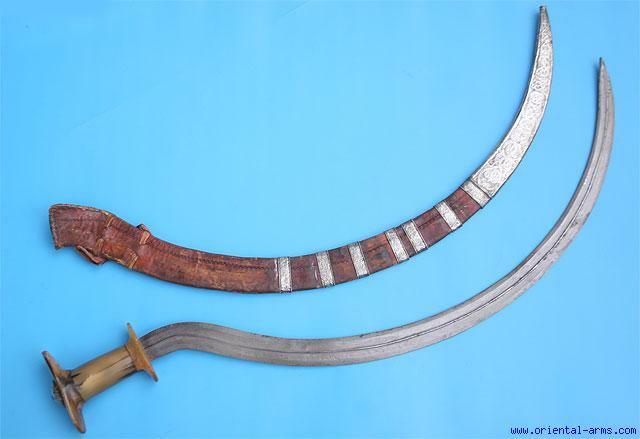 The shotel is an extremely curved sword. Its unwieldy nature gives users a -1 penalty to hit in close quarters, but it deals 1d6+1 damage and ignores the presence of shields. 12 dinars. The naft projector, as designed, is not viable for individual use, but can certainly be mounted on ships or placed for structural point defense. Naft is similar to Greek fire; the projector heats the naft before spraying it out through a brass nozzle under pressure (50' range). Individuals within the firing arc of a naft projector must save vs. breath weapon or take 1d10 damage for 2d4 rounds. Not a staple naval weapon because you're creating a fire on board your ship and transporting an extremely hazardous chemical; choppy seas can result in... awkward results. The use of flaming oil has a long pedigree in D&D, but naft grenades make that easier. A naft grenade has a pre-inserted wick that can be lit and the grenade then thrown; it will deal 1d10 damage as long as it burns. Each round it burns, roll a d4; if the roll is greater than the number of rounds it's burned, then it keeps burning. (So on the first round of burning, it will continue to burn on a 2-4; on the fourth round, it will go out). Naft grenades are officially restricted to use by the military, but available on the black market for (d6+1)x10 dinars. Can be coiled up in a torc before being withdrawn. Deals 1d4+1 damage, but can be concealed easily. Available on the black market for (2d4)x10 dinars.